AFC Fylde won through to the Buildbase FA Trophy final at Wembley after breathless late drama at Edgeley Park. They will face National League promotion rivals Leyton Orient in the non-league showpiece on May 19. 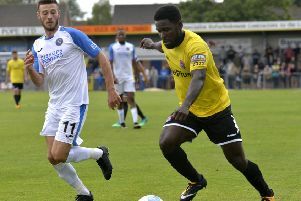 After the goalless first leg of their semi-final at Mill Farm a week ago, Stockport and Fylde were tied at 1-1 with five minutes of the deciding leg remaining. But then in the space of three heart-stopping minutes, Ryan Croasdale put Fylde in front for the first time, then the Hatters levelled only for Alex Reid to net the winner almost immediately and send the 538 Wembley-bound Coasters fans in a crowd of 6,000-plus into ecstasy. Fylde boss Dave Challinor made two changes to his starting 11 from the first leg, with Danny Philliskirk and Reid promoted from the bench in place of Tom Crawford and Serhat Tasdemir. Fylde keeper Jay Lynch was forced into the first save of the game on 10 minutes, comfortably getting behind Scott Duxbury's header from an Elliot Osbourne corner. Danny Rowe had Fylde's first shot in anger two minutes later, firing over from the edge of the box. Jordan Keane sliced a shot wide for the hosts, who took the lead on 25 minutes, when Nyal Bell caught out Lynch with a shot from the left which found the bottom corner. Fylde were almost level three minutes later, when Rowe's free-kick crashed off the bar and Croasdale's follow-up effort was blocked. It almost got better for the hosts just past the half-hour as Bell headed just over from a corner, then an Ash Palmer header found the net only for the referee to disallow the goal for a foul. Fylde had chances to equalise before the interval as Nick Haughton's long-range effort just cleared the bar and Rowe's cross-shot flew just wide. However, Fylde still trailed at half-time and were forced to replace the injured Haughton with Crawford in added-time. Fylde threatened after the break but didn't manage a clear sight on goal until Philliskirk's shot was well saved by Ben Hinchliffe just before the hour, then at the other end Osbourne headed over from a swift Hatters break. Osbourne then turned provider on 62 minutes but Matty Warburton's near-post effort was well saved by Lynch. But the Coasters gained a lifeline on 65 minutes, when James Hardy was brought down in the box and Rowe buried the penalty. After opportunities at both ends, Fylde hit the front with five minutes remaining, when Zaine Francis-Angol's low cross found its way to Croasdale, who made no mistake. But Stockport were back on terms on 88 minutes, when a corner found its way through the crowd for Palmer to head home at the far post. But 60 seconds later Fylde were back in front as Reid fired in off the post after Hardy's surge forward. The closest to a goal in four minutes of stoppage time came when Francis-Angol fired over after a strong run. 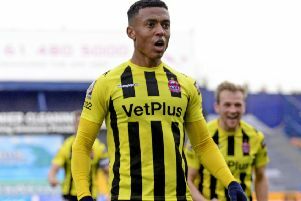 It means Tuesday's return to league action at Leyton Orient will be a dress rehearsal for the Trophy final after the O's won both legs of their semi to overcome AFC Telford 3-1 on aggregate. To complete a great day for Fylde, they remain fifth in the league table after none of their promotion rivals managed a victory. Stockport: Hinchliffe, Minihan, Duxbury, Keane, Palmer, Stott, Thomas (Turnbull 78), Walker, Bell (Mulhern 53), Osborne, Stephenson.